You might be thankful for family, for home, for the long-needed sporadic, but drought-quenching rains we’re enjoying on the southwest coast. But the greatest gift you have is You—your consciousness, your life. This is the Creator, God, IN and AS YOU. There is a Sufi saying: “La ilaha ill-Allahu” meaning the Creator (“Allahu”) is everything. Literally it can be translated: “There is nothing other than You, only You are God.” Sh’ma Yisrael (“Hear, O Israel: the Lord our God, the LORD is one”) is a similar Jewish prayer. If we contemplate this, that everything we know of IS the Creator, then we realize we are one with the Creator. We can then make the leap to realizing each of us is potentially the Christ child, the spiritual Christmas gift, the savior, or liberator, anticipated by the world’s great religions. Sunburst’s founder, Norman Paulsen, liked to use the Christmas Tree as an analogy for a human being. My version is that the Star atop the tree represents your Pure Self. 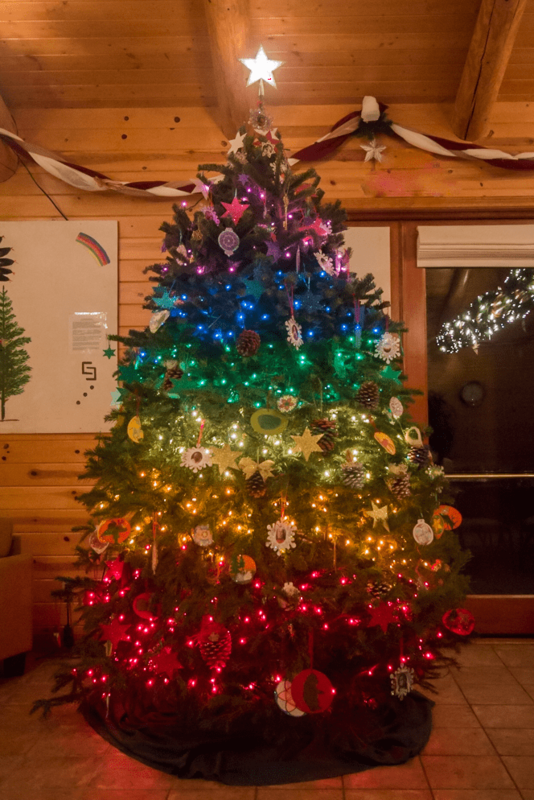 The rainbow of colors, as we have represented on our Lodge Christmas tree, represent your spinal chakras, with red (life force) at the bottom. We can open the flower of our ourselves—develop and express our gifts, our talents and virtues—and live more fully. Let’s aim for realizing our oneness with the Creator every day of 2017.